Tower Life Building Vertical - San Antonio images on prints, canvas and metal. This is a vertical capture of the Tower Life Building which is a landmark and historic building in Downtown San Antonio, Texas. 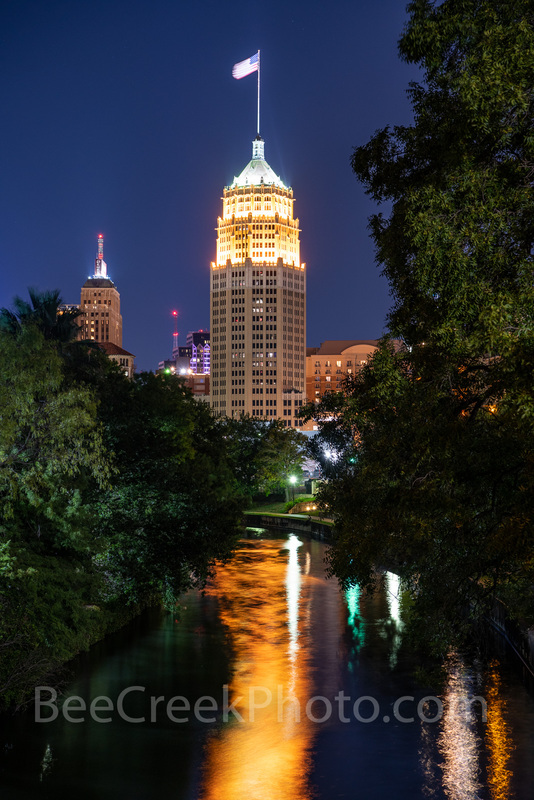 The Tower Life building is a major part of the San Antonio skyline with it masses flag pole it can't be missed. The Tower building was completed in 1929 it was 403 feet with 30 floors at the time. In 2010 it was renovated and a copper top was place on it with a 100 ft flag pole attached to the top as in the orginal design. The 30 story, eight sided, neo-gothic, brick and terracotta structure is an easily recognizable landmark with its gargoyle rain spouts, green patina copper top and flag pole. The Tower Life building was first occupied by Sears but has been owned by many businesses since it completion in 1929 today it is owned by Tower Life Insurance company. The builiding was placed on the National Register of Historic Places in 1991. Photo © copyright by Bee Creek Photography - Tod Grubbs / Cynthia Hestand.